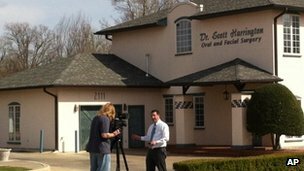 Health officials in the US state of Oklahoma have warned 7,000 patients their dentist may have exposed them to HIV and hepatitis B and C.
Patients of Dr W Scott Harrington’s practice in Tulsa were advised to test themselves at a free clinic set up by the state, health officials said. Health inspectors found rusty dental instruments and poor hygiene standards at the clinic. Dr Harrington has voluntarily closed the practice, officials said. The letters are being sent to patients treated since 2007, but health officials have said they do not know who may have been seen by the dentist before that. The Tulsa Health Department is setting up a clinic to carry out free blood tests for people who may have been exposed. Former patient Joyce Baylor, 69, who had a tooth removed by Dr Harrington about 18 months ago, said the office looked clean. “I’m sure he’s not suffering financially that he can’t afford instruments,” she told the Associated Press news agency. The investigation into the dental practice began after a patient tested positive for both hepatitis C and HIV despite having no associated risk factors. Officials determined the patient had received dental treatment about the time the exposure was believed to have occurred. The dentist has voluntarily given up his licence, closed his practice and is co-operating with investigators, the Tulsa Health Department said. Dr Harrington faces a hearing on 19 April and could have his licence revoked permanently. This entry was posted in English and tagged Tulsa dentist by kiumars. Bookmark the permalink.